Recently our Technical Director Fritz Buss was interviewed for an article on allergen management in Quality Assurance & Food Safety. In the article Buss stated, “the first challenge is identifying the allergens…that are present in their facilities.” Once the allergens are identified, color-coded products can be implemented to prevent cross contamination. Many new guidelines and requirements are being put in place to regulate processors and aid in allergen management. 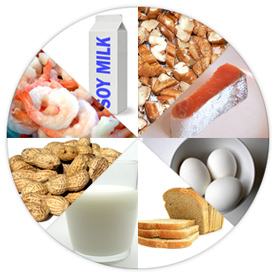 Starting December 13, 2014 the United Kingdom will have a new Allergen Labeling Rule put in effect, which requires manufacturers to declare 14 major allergens compared to the United States’ “Big 8” (Milk, Eggs, Fish, Shellfish, Tree Nuts, Peanuts, Wheat and Soy). Click here to read the complete article. For more information on color-coded products, see our Color-Coded Products page on nelsonjameson.com. This entry was posted in Food Safety, General and tagged allergen, color-coded, food safety, regulation. Bookmark the permalink. Follow any comments here with the RSS feed for this post. Both comments and trackbacks are currently closed.